Production processes in the electronics and food industries. Movement of a passenger vessel. Processes of production and transportation of the Dead Sea salts. Buildings Cathedral of the Annunciation in Nazareth, the Church of the Nativity, Chapel of Mary Magdalene. Church building on-site treatment of Jesus Christ with the Sermon on the Mount. Views of the city of Nazareth. Writer Amos Makadi at work. Family members of the movie producer Zvi Spielmann at dinner. View from the sea of ​​the city of Haifa. Workshop for the production of ceramic products. Recording of Big amateur ensemble in one of the studios. Exhibition Opening graphics Jewish Museum of Fine Arts. Chairman of the Committee of Cultural and Scientific Relations Israel M.Klauzner opens the exhibition. 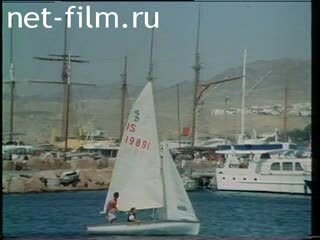 Lake Tiberias (Sea of ​​Galilee, Lake of Gennesaret). A fisherman casts his net. Locality in which they live Druze. Bedouin donkey pack and go to the desert. Bedouin life in the desert (staged footage). Shepherd with a flock of sheep in the pasture. Development of new arable land. Residential buildings, developed by the Institute of Deserts. Priests on a city street and in the temple. Children with cancer treated at a clinic. Former director of the Institute of Solar Energy Sciences of the USSR Vladimir Lerner Research Institute and co-workers. Worker washes windows of a tall building. Gur Aryeh Mayor talks about the problems of cohabitation between Arabs and Jews (synchronous and over). Meeting members of the public organization "Shelom-Ashafa" ("Peace Now"). Trail, fitted at the bottom of the canyon. Movement SUVs on the highway. Youth bathed in a mountain lake. Agricultural commune (kibbutz) "Gansch Shmuel." Members of the commune over dinner at the Feast of the first harvest. Sale of agricultural products in the store. Sale of agricultural and industrial products in the area of ​​one of the cities in a day. Couples dancing in the street at the entertainment center. The cameraman shoots the bride and groom. Celebrating the Day of age. Guests at the holiday table, hero of the occasion performs the dance. Interior view of the synagogue. Passengers in the cabin, down the ladder. The resort on the coast. Ships and pleasure boats at the dock. A group of men praying at the Wailing Wall. Ceremony to commemorate victims of fascism. Parade participants antifascist movement and resistance from various countries. A woman miraculously survived during mass destruction at Babi Yar - among participants. Museum of the victims of fascism. Mother weeps at the grave of her son. Repository of ancient manuscripts found in the Qumran caves. Ruins of the ancient fortress of Masada. Solemn ceremony of Israel's independence. Israel state flag on a flagpole. British military leave the territory of Palestine, climb aboard. 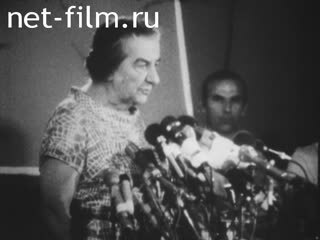 The first Israeli Ambassador to the USSR Golda Meir at the Kremlin. Remains of the ancient Jewish settlements in the Sinai desert. Sand cave on the west coast of the Dead Sea.